Successfully Added Teclast Active Stylus Pen - 15 Hours Usage Time, For Teclast Tbook11, Tbook16 Pro, Tbook16 Power, Tbook10, Tbook10 S, x98 Plus to your Shopping Cart. The pen has a clip design so it's easy to carry or keep in your shirt pocket. Built-in rechargeable battery brings up to 15 hours of normal usage time. The Teclast active stylus pen has a narrow nib that brings a high degree of accuracy, letting you write and draw with precision. If you want to take notes in class or a meeting then this offers a great choice. 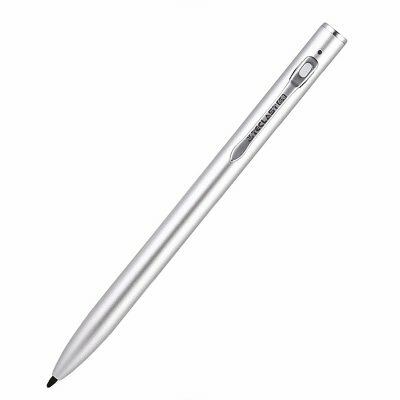 The barrel of this stylus is a smooth and firm metal that sits comfortable in the hand and a small LED light on the top indicates the pens status. Used with a drawing app you can let free your creative side and sketch away as you please. This stylus pen has a built-in battery and can be recharged through the mini USB port on the very top. Under this sits the clip allowing you to keep the pen securely in your pocket or bag so it's always at hand when you need it. This Teclast active stylus pen comes with 12 months warranty, brought to you by the leader in electronic devices as well as wholesale tablet PCs and accessories..